With wave season well underway, travelers are booking cruises at discounted rates. 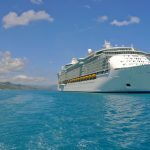 Before deciding whether or not a travel insurance policy is worth the cost, leading comparison site, Squaremouth, explains four benefits to look for when buying a policy for your cruise. Medical and evacuation costs are significantly higher at sea. Squaremouth recommends travelers get a policy with at least $100,000 in Emergency Medical coverage and $250,000 in Medical Evacuation coverage. If you miss your cruise departure due to bad weather or other airline delays, the Missed Connection benefit can cover your expenses to catch up to your cruise at the next port. This benefit can kick in as soon as three hours into a delay, and coverage can range from a few hundred dollars to more than $2,000. The Baggage and Personal Items Loss and Baggage Delay benefits can cover your costs to buy clothing, toiletries and other essential items if your bags are lost or delayed by your airline on the way to your cruise. You must keep all receipts to be reimbursed by these benefits. If your flight or cruise is significantly delayed or canceled due to bad weather, travel insurance can reimburse your full trip cost. To be covered, the delay typically must last 12-48 hours.